Summer has come and gone (although this year, I really feel like I completely missed it. Besides those three weeks in August, where was it?). With the fall season and cooler weather upon us, there's nothing that makes me more giddy than slow cooking. Whether it's something roasting in the oven or bubbling on the stovetop, the warmth and smells that emanate throughout your home. And cool weather screams a hot bowl of homestyle soup to snuggle up with. Chinese soups in the Canton cuisine (the cuisine I grew up with at home and am most familiar with out of all the various types in Chinese cooking) are slow affairs. Called "老火湯" (literally translated as "old fire soup"), these Cantonese soups are often boiled for hours over a hot stove with some form of protein and bones (pork bones, chicken, chicken feet, etc.) and vegetables for flavouring. Additional Chinese herbs will then be added, making these soups not only delicious, but beneficial to one's health as well. By cooking the soup for a long period of time, the water evaporates, leaving a very concentrated and incredibly flavourful (and nutritional!) broth by the end. Best of all, slow-cooked Chinese soups are the easiest thing to make. Simply throw everything into a pot and let the stove do all the work for you! You have the rest of the day to clean the house, do the laundry, run some errands or just sit back and catch up on your reading. If making a pork-based soup, I often like using shoulder ribs. It has bone to give the soup that depth of flavour you want, but also carries with it a good portion of meaty goodness which you can munch on later (while still remaining tender without being all dried out). Ask your butcher to cut them into smaller pieces for you. And be sure to blanch the pork ribs before you make the soup—you don't want to end up with a bloody and metallic tasting soup. When serving the soup, be sure to serve some of the meat and vegetables alongside it (we Chinese folks love that!). Sprinkle with some sesame oil and soy sauce if you wish. 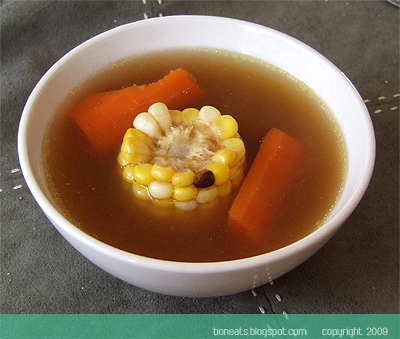 Give this sweet corn and pork ribs soup a try. 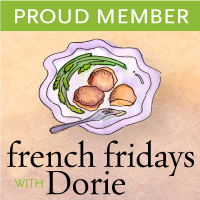 It's good for you, and the naturally sweet broth will be a nice surprise for you. Before you begin to make the soup, blanch the pork ribs in a large pot of water for about 10 minutes to get rid of the blood and any impurities. Rinse and set aside. 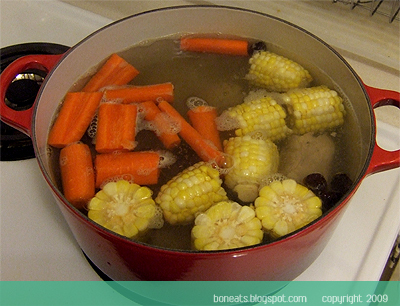 In a large stockpot, bring water to a boil. Add all the ingredients and bring to a boil again, then reduce to a simmer over medium-low and let simmer for about 3 to 4 hours. The water should have reduced by at least half by the time it is ready. If water has reduced too fast, just add a little more. Before serving, season with salt. Serve immediately, and serve the meat and vegetables on the side, sprinkling with some sesame oil and soy sauce if desired. ** NB. Available in Asian supermarkets and Chinese herbal medicine shops. Posted by Bonita at 10:19 a.m.
Karine October 4, 2009 at 2:25 p.m. Your soup sounds delicious and recomforting!